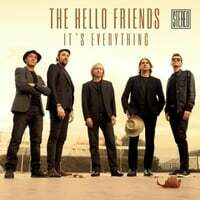 'The Hello Friends invite you to their Juicy Pop-Rock Festival wrapped in Magic Choruses and Catchy Rhythms, with Songs of Classic style that have travelled many miles to be born in 2018 and full of Vocal Harmonies rescued from Byrds, Beatles and Crosby, Stills & Nash. With their Elaborate Arrangements and Sounds and within a very detailed Production, they will tell you Stories of Ancient Romances but at the same time absolutely modern, so you never stop feeling the weight of Oblivion. A true World of Symphonies of Electricity and Emotion, wanting to hold on and let yourself go at the same time. “The Hello Friends te invitan a su Festival de Pop-Rock Jugoso envuelto en Estribillos y Ritmos pegadizos, con Canciones de corte Clásico que han recorrido muchos Kilómetros para poder nacer en pleno 2018 y Armonías Vocales rescatadas de Byrds, Beatles y Crosby, Stills & Nash. Con sus Elaborados Arreglos y Sonoridades y en el marco de una detallada Producción, te contarán Historias de Romances Añejos pero a la vez tremendamente actuales, para no dejar nunca de sentir el peso del Olvido. Un Mundo de Sinfonías de Electricidad y de Emoción, de querer a un mismo tiempo Aferrarse y soltarse.